Hiatus hernia is a very common pathology affecting three in five people over the age of 50. 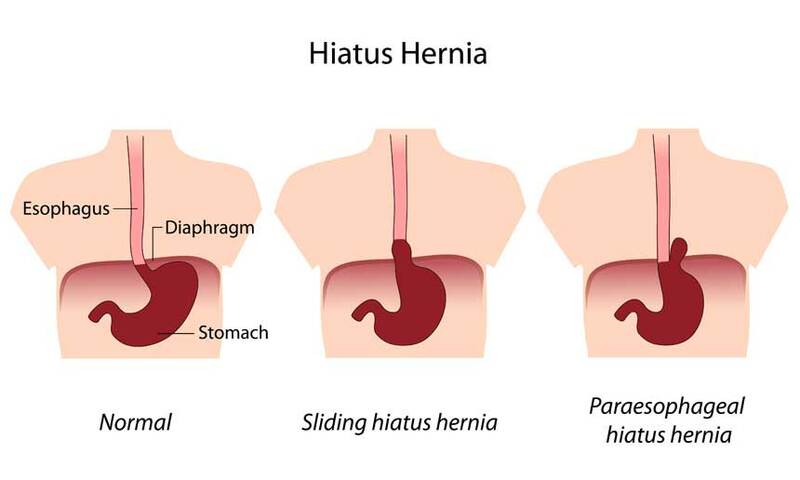 Hiatus hernia occurs when part of the stomach protrudes upwards through the opening (hiatus) in the diaphragm through which the food tube (oesophagus) connects to the stomach. This can lead to acid stomach content entering the lower part of the oesophagus causing symptoms. Increasing age and obesity are common risks factors for developing a hiatus hernia, while trauma, persistent straining, coughing or vomiting or previous surgery to the area may also cause it. One of ten patients with hiatus hernia will have symptoms. The constant exposure of the oesophagus to the stomach acid may leads to symptoms of gastroesophageal reflux, heartburn, taste of acid in the back of the mouth and/or swallowing difficulty, chest pain or shortness of breath. With time exposure of the oesophagus to the acid may lead to narrowing (stricture) of the oesophagus or to the development of Barret’s oesophagus (precancerous changes). On rare occasions the part of the stomach protruding into the chest through the diaphragm can become strangulated becoming a surgical emergency. A careful history and examination will be undertaken at the clinic. A number of investigations may be required to establish the diagnosis and exclude other conditions. The specific investigations required to diagnose a hiatus hernia include a swallowing x-ray test, an oesophagogastroscopy and/or manometry with pH monitoring of the oesophagus. The great majority of patients will only require lifestyle changes similar to the ones suggested for gastroesophageal reflux disease. If these fail medication that neutralise, reduce or block the acid in the stomach can be used. Surgery in the form of laparoscopic fundoplication, is usually reserved for those patients that have symptoms despite the medication, people with narrowing of the oesophagus, significant inflammation of the oesophagus or a large hiatus hernia causing significant pain or shortness of breath. The most appropriate management option will be discussed with you at an individualised level.